Atiq Bhatti, president of the Ahmadiyya Muslim Community in Slough, said having a mix of speakers and guests was ‘very important’ for the symposium to be a success. 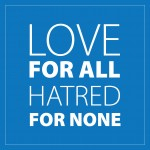 Atiq said: “The symposium was to promote love for all and hatred to none. “We are all brothers and sisters at the end of the day, regardless of religion or race. “It is about service to humanity, about coming together and serving with one incredible voice that we are united against extremism.